Introduction to Hygiene and Sanitation | Infonet Biovision Home. 2.What are hygiene and sanitation? Health risks: Look carefully at this drawing and become familiar with all these seven possible ways in which microbes from faeces can make us ill. Sanitation is enshrined in the Millennium Development Goals and is a cornerstone of the fight against poverty. Lack of basic sanitation puts millions of lives at risk and is responsible for a quarter of all child deaths in developing countries every year.1 Lack of sanitation and poor hygiene also severely limit the impact of other development interventions in education, health, rural and urban development. An enormous amount of resources has been expended on providing sanitation facilities, yet still over 2.5 billion people do not have access to basic sanitation services (WHO/UNICEF - JMP, 2008). Throughout the developing world the low sanitation coverage figures paint a stark picture. Furthermore, sanitation hardware alone is not sufficient: in many instances even though new toilets and washing facilities have been built, and coverage is recorded by officials as relatively high, proper usage remains low and little or no benefit is derived. Indeed, awareness is growing amongst public health practitioners that, until hygiene is properly practiced, both at home and in the community as a whole, the desired impact of improved water and sanitation services in terms of community health benefits cannot be realised. Over the past four decades practitioners have strived to find ways to reduce not only the huge number who remain without access to a toilet but also the huge number who do not use facilities hygienically even when they are available. The methods used to address this problem endeavour to engage target groups (individuals, households, communities, institutions or even organisations) in development programmes that enable a change in behaviours or create a demand for services. These methods or approaches are generally referred to as "software" activities to distinguish them from the provision of hardware. What are hygiene and sanitation? In communities where facilities for safe disposal of faeces are inadequate, the major part of the diarrhoeal disease burden originates from infected faeces. Infectious agents are transmitted from faeces to hands to mouth (which can occur directly, or indirectly via other surfaces e.g. toilet surfaces), or by consumption of food or water which has become contaminated with faecal organisms. 'Faecal:oral' transmission is illustrated by the F-diagram shown in the image above. Breaking the chain of faecal-oral transmission is achieved by a combination of improved sanitation and good hygiene practices. Animal faeces can also be the source of diarrhoeal disease, as can contaminated food purchased from a market or a contaminated community water supply. Respiratory tract infections such as colds and flu, result either from inhalation of infected mucous droplets, or by rubbing the nasal mucosa or the eye with mucouscontaminated hands. Data now shows that good respiratory hygiene (safe disposal of nasal mucous and handwashing) can reduce the risks of respiratory infections; for instance, a study by Luby et al (2005) showed associations between hand hygiene and Acute Respiratory Infections (ARI) in children under five; when children?s hands were washed at the recommended times significant reductions in ARIs were noted. The association between hand hygiene and ARIs is very topical with worldwide concern over the spread of SARS (severe acute respiratory syndrome) in 2003 and more recently Influenza A H1N1 (commonly known as swine flu). The World Health Organization (WHO) has raised the swine flu virus outbreak to a category 6 or global pandemic level (WHO, 2009) and as a consequence national governments are now running health information campaigns in order to try and limit its spread. These campaigns demonstrate how the association between handwashing and the spread of ARIs is being used to encourage people to change behaviours and follow good hygiene practices; for examples see the British government's 'Catch It, Bin It, Kill It' slogan (UK Government, 2009) and the Information on Influenza A H1N1 displayed on the Ministry of Health and Family Welfare, Government of India (2009) webpage. For skin and eye infections, the hands are probably the major route of spread of infection. 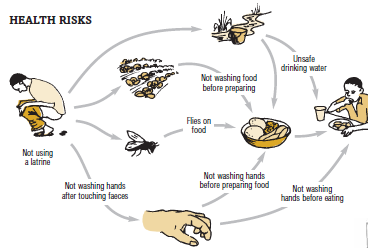 Trachoma is largely preventable through hygiene (face washing breaks the infection cycle). Fly control through hygienic latrines is also important. For intestinal helminths, the hands, along with human faeces, are the major route for spreading a variety of intestinal helminths, which, while they do not necessarily contribute to mortality do contribute significantly to morbidity in children under 15 years of age. Ensuring access to adequate safe water at point of use. 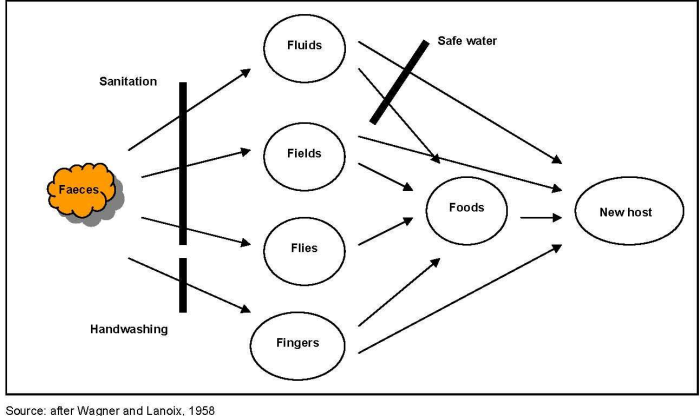 Other hygiene practices such as improved food hygiene and solid waste management are important as well; practitioners generally introduce these once the three primary interventions are in place. Of course the ranking of risks may vary from one community to another, for example in some communities risks associated with poor food hygiene may be greater than those associated with poor household water quality.